The hallmark of Dr. Smoothie Café Essentials Cocoas are their reduced sugar levels & the prodigious amounts of cocoa. Dr. Smoothie covers all the bases with cocoa products designed to work with hot water as well as steamed/hot milk. Dr. Smoothie hot cocoa powders deliver a full taste experience that assures repeat customers. Assort a case of five 3.5 lb. 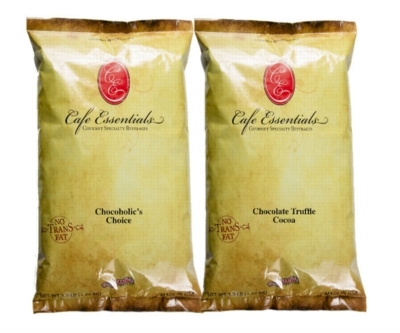 bulk bags of delectable flavors like chocoholics choice and chocolate truffle.